Sand Volleyball Drop-In Kickoff - Tonight! Thursday, May 11 | 6 p.m. Interested in enjoying the new LaVern Park, hanging out with friends and neighbors, and playing a little volleyball? Ahhh, who can say 'no' to the feeling of sand in your toes! Join us for a summer sand volleyball kickoff, to be the voice of regular drop-in sand volleyball! Meet at the new sand volleyball court in LaVern Johnson Park, tonight (May 11), at 6 p.m., and get ready to play! All ages welcome! Please join the planning and design team as they share the concept plan for future use of the Deed Restricted Buy-Out Properties (DRBOP) at the St. Vrain River Confluence. Come check out the plan, talk with the design team, and give us your thoughts! Please note: this meeting will be held at the WPA Shelter in LaVern Johnson Park, beginning at 6 p.m. on May 18, with site visits to follow the presentation. Parking will be free for all attendees. Boulder County Transportation and the State of Colorado have completed the technical review and public outreach period for the draft floodplain maps developed by the Colorado Hazard Mapping Program (CHAMP) for ‘Phase 1’ major stream corridors in areas of unincorporated Boulder County. When: Tuesday, May 16, 2 p.m.
Public testimony will be taken. For additional details about this hearing and the mapping program, visit www.BoCoFloodplainRemapping.com. Looking for a meaningful job, or know someone who is? Full-time, part-time, seasonal, and permanent positions are all available! Check out our current job openings, and apply to work for this awesome community today! 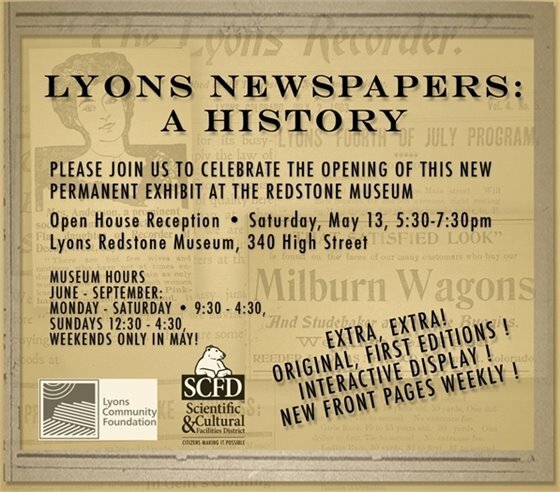 Saturday, May 13 | 5:30 p.m. to 7:30 p.m.
Lyons Community Foundation has been Making a difference in Lyons for 10 years! Did you know that LCF Scholarships have contributed over $26,000 to dozens (about 20%) of Lyons -area students to aid in their dreams of attending college? 2017 Scholarship winners will be announced next week.